Happy New Year indeed! What a way to start 2013! I was very happy to read the news this morning about the $500 million dollar acquisition of the on-demand car service, ZipCar by Avis. Why? Aside from being a ZipCar member and proponent of the collaborative consumption industry (#CollCons) – also know as the sharing economy – my company has a similar business model to ZipCar, although in a different space (pun intended). After the demise of LooseCubes, the media’s favorite peer-to-peer desk sharing marketplace, many people thought the tide was receding on the collaborative consumption industry. Who could blame them though – prior to closing in mid-November the company had just raised $7.8 million dollars in June. How could a company with so much money and so much publicity go out of business so fast? Maybe CollCons is just a fad and we’ll never see market adoption large enough to provide a significant return to investors. Not so fast! I said before that CollCons did not die on 11/16/2012, and this ZipCar acquisition news is definitely a strong signal for the collaborative consumption industry. The industry was born out of recession in 2008, and it’s not going away now that the world economy is beginning to emerge. People have embraced the sharing economy and the public and private sectors are learning how to jump on board to save money and make the world better. Companies like ZipCar, who implement the B2C CollCons model will succeed because they solve the problem of inconsistency that can deter some people from collaborative consumption. Most people think of peer-to-peer (P2P) services when they think of collaborative consumption. But some people are turned off by the bad experiences they’ve had as a result of doing business with random people. Enter the B2C CollCons model. 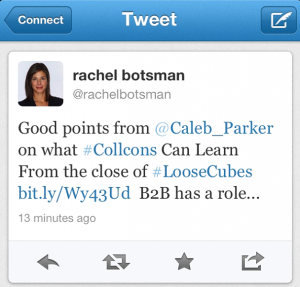 B2C CollCons companies enable their customers to share ‘widgets’. The widget becomes a service, or rather use of the widget does. Instead of buying the widget from the company, customers share usage of it. This model enables people to collaborate on consumption without doing business with random people. The B2C company ensures superior service and a consistent customer experience. Even CollCons champion, Rachel Botsman, believes this model make sense. I suspect we’ll see more B2C CollCons companies succeeding in the sharing economy. This entry was posted in Blog, Collaborative Consumption and tagged collaborative consumption, CollCons, Steve Case, ZipCar. Bookmark the permalink.